This afternoon on the Aurora, we headed a bit north of the SW corner of Stellwagen to find a bit of a feeding frenzy! Once we arrive at the bank, our captain observed some splashing way on the horizon, which turned out to be Glo-Stick kick feeding! When we arrived closer to the splashing, we came upon a group of four humpbacks in the midst of kick and bubble net feeding. We had a spectacular view as two adult surfaced filtering – and two smaller whales rolling around amongst the bubbles. These four turned out to be Glo-Stick and calf, and Milkweed (born ’02 to Zeppelin) and calf! The water was very clear – and all of us were awed as we could observe the group traveling underwater (see photo). After this, the two pairs split, and we stayed with Glo-Stick and her calf. 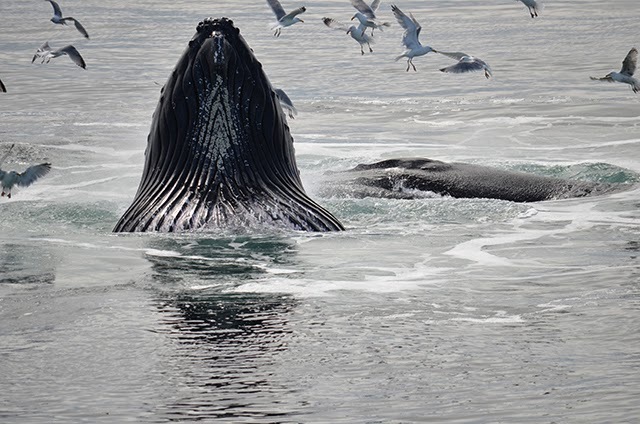 Glo-Stick and her calf treated up to some spectacular displays, and we observed some of the intricate feeding behaviors that humpbacks are known for around here. Over and over again, we would watch Glo-Stick lob and kick her tail several times (see photo), go for a dive, create a spiral net of bubbles, and then come up filtering with a mouthful of seawater and bait. It was also fun to see her calf come up in the bubble net, sometimes it appeared to be participating (hopefully learning! 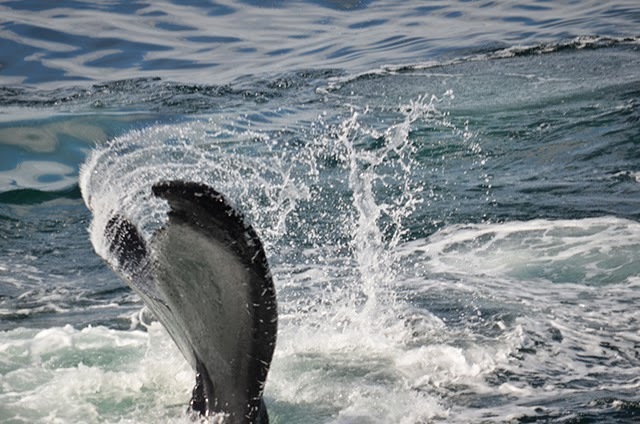 )—but then it clearly began to be more playful/mill as it rolled, lifted its flipper in the air, and even surprised us with a big breach in front of the boat! 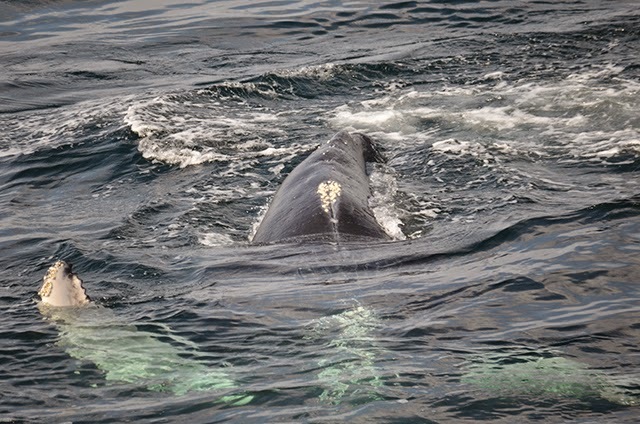 This calf also laid belly-up for a few moments (see photo) – and it appears to be a boy! 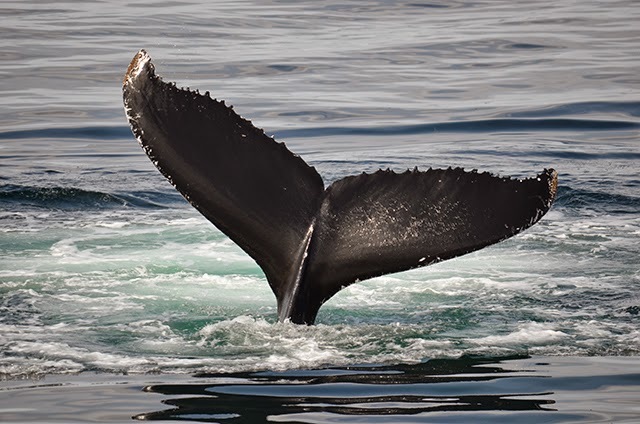 Just as we thought the day couldn’t get more exciting, we spotted a fifth humpback kick-feeding – this whale was Sundown, a female first seen in 2007. She spent the whole time we were out there kick feeding (see up-close photo attached). 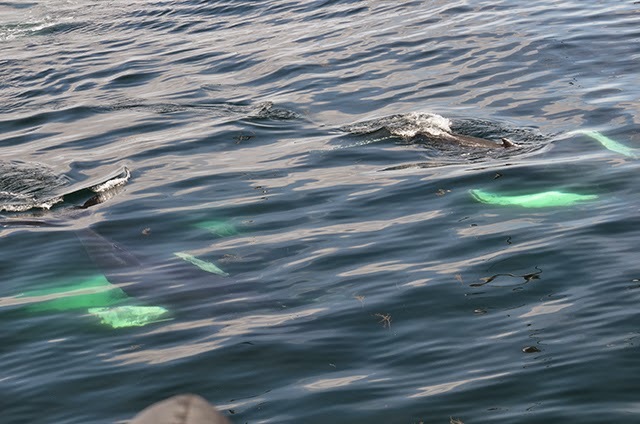 We also had 2 to 3 minke whales traveling around, as well a grey seal making it a three species day! It was also nice to see a ton of gull activity around the whales. We wrapped up the trip with Glo-Stick and calf, who were joined once again with Milkweed and calf. Milkweed and Glo-Stick starting feeding together again and at one point Milkweed came up completely vertical with her mouth engorged, while Glo-Stick corralled alongside her (see photo). The calves stayed in the area, and Milkweed’s calf, who had generally been staying along its mom’s side, got a bit curious of the boat and spent the remainder of the trip swimming underneath the boat and pulpits (we had to stay out of gear for quite some time today!). Overall a wonderful afternoon on Stellwagen! Check out the morning trip here.